If you have decided to grow a beard, but have no experience in doing so you might need some advice about how to proceed with your facial hair project. When you grow a beard, you will become a member of a different group. There are beard clubs and other groups where you can garner support. To help with the growth of your beard, you should try some beard supplement. To strengthen and revitalize your facial hair, include beard tonifying gel in your beard care regimen. If you are growing a beard, remember good things come to those who wait. Your beard won’t grow overnight. You must be patient and wait. Perfection does take time. You want to do some moisturizing, so use beard cream or beard balm. These products nourish your beard and help soften the hair. It also helps you soften and nourish your skin underneath the beard. While your beard growth is still new and perhaps in the long stubble stage, you can benefit from beard spray. This product helps throw healthy beard growth into overdrive. You won’t have to use shampoo on your facial hair while it is still short, but you want to make sure your stubble stays clean. You can use a natural bar soap that is free from harsh chemicals. After the beard hair is long enough, you can transition to beard cleansing products, such as beard wash. If you aren’t near your shower, you can always use beard cleansing gel. While your beard is growing and starts to look untidy, you should properly trim it along the neckline, upper cheeks, and mustache lip. If you are wanting to grow a natural beard then leave it untouched. It is recommended to wait a month before doing this trim. Don’t cut the neckline too high. An ideal neckline is where the neck meets the head. Any beard parallel with the ground should not be trimmed, but any beard that is parallel with the world that is front of you can be trimmed. You should not have to look upwards in order to trim. You should have a nice round curve that reaches from one ear to the other. Now you are on your way to having an attractive beard that is going to get you plenty of attention. 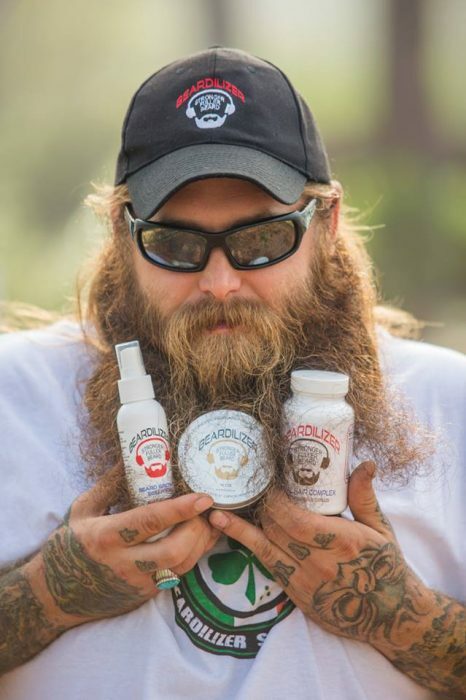 For the best beard products, Beard-Growth.com has you covered!